Card Text Play: Choose 2 friendly creatures and 2 enemy creatures. Shuffle each chosen creature into its owner’s deck. Can I play this if I have no friendly creatures and there are enemy creatures? Yes. You always resolve as much as you can. If there are no friendly creatures, you only shuffle 2 enemy creatures into their owner’s deck. 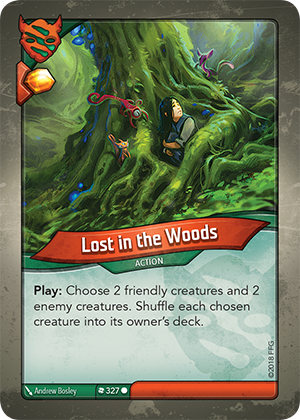 If there are no creatures in play, can I still play Lost in the Woods for the Æmber bonus? Yes. The first step in playing any card is to receive the Æmber bonus, if any. Therefore, you can always play action cards to get the Æmber bonus, but are still obligated to resolve as much of the action card as possible. If the “Play:” ability of the action card is not resolvable, you still keep the Æmber bonus.